ADJ has launched its new POW-R BAR65 and POW-R BAR LINK professional-caliber utility power blocks. These forward-thinking robust power strips have been specifically designed for distributing reliable, surge-protected power on stage and at front-of-house, monitor mix and DJ positions. 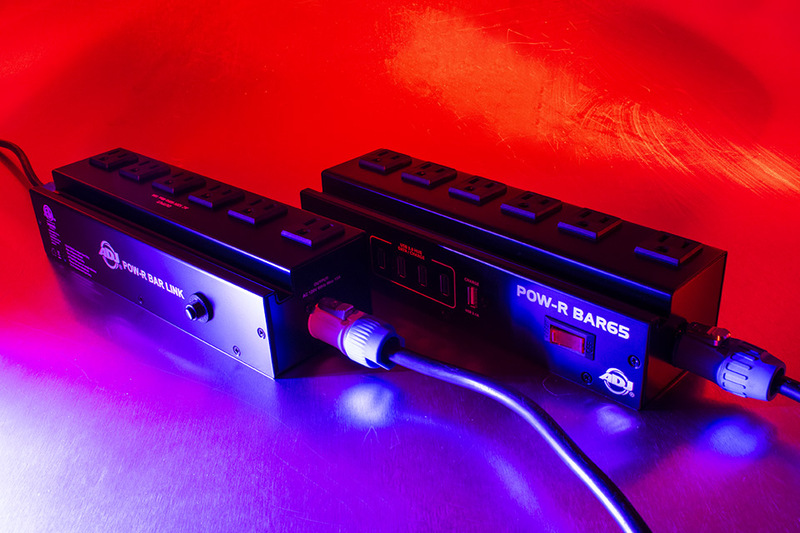 The innovative POW-R BAR65 is a utility power block that is fitted with six well-spaced-out and surge-protected 3-prong Edison 120V AC sockets which can be used for providing power to a wide variety of sound, lighting and effects equipment. It also has a USB charging port that can be used to provide power for a mobile phone or tablet and its case features a recessed slot that serves as a stand for one of these devices. This makes it ideal for use by sound, lighting and AV professionals to manage power distribution at front-of-house or other control positions. In addition, the POW-R BAR65 also incorporates a 4-port USB 3.0 hub, which can be used to hook up multiple USB storage and control devices to a laptop computer. These four ports can also charge mobile phones as well. This makes it perfect for use as a part of a front of house, lighting desk or mobile DJ setup. The POW-R BAR65 features a built-in circuit breaker, with an Off/Reset rocker switch on the side, and a locking powerCON power inlet socket. It is supplied with a 6-foot Edison power cord, but this can easily be switch out for a longer cable if required. Also new to the ADJ range is the POW-R BAR LINK. This is similar to the POW-R BAR65 – offering six surge-protected Edison 120V AC sockets – but without the USB hub and charging socket. It does, however, have the added benefit of a powerCON outlet socket, allowing multiple units to be daisy-chained together to provide extended power distribution. This makes the POW-R BAR LINK ideal for providing backline power on a stage or for linking with a POW-R BAR65 to provide additional power sockets at a control or DJ position. The POW-R BAR LINK is also fitted with an M10 bolt hole on its rear panel, which can be used to fit a clamp to allow hanging from a truss or lighting stand. This means the unit is also ideal for providing simple and reliable power distribution for a lighting rig or AV installation. Both models are compact – measuring 10.5” x 3.3” x 2.5” (268mm x 84mm x 65mm) – and lightweight – just 3.0 lbs. (1.3kg). However, they also have a high load capacity of 15 amps and a heavy-duty metal construction that has been designed to withstand the rigors of the road. The innovative POW-R BAR65 and POW-R BAR LINK are designed to make life easier for sound and lighting professionals and help protect their equipment. They are not only safer than cheap plastic power strips but look more professional and are built to stand up to the rigors of the road.